A samurai wasp (Trissolcus japonicus) lays an egg inside a brown marmorated stink bug (Halyomorpha halys) egg. The samurai wasp’s offspring will develop inside the pest’s egg and emerge as an adult wasp. Photo by Warren Wong. Thought to be Canada’s most promising potential defense against the brown marmorated stink bug – a globally spreading agricultural pest native to Asia – the samurai wasp (another species from Asia and natural parasitoid of the former) has been considered for future release in the country in recent years. However, prior to any formal decision and regulatory approval, the parasitoid, which is known to be specialized on stink bug eggs, was identified at a heavily infested site in Chilliwack, British Columbia, during a survey of the local enemies of the bug, conducted by a research team led by Dr. Paul Abram of Agriculture and Agri-Food Canada. Their findings are published in the open-access Journal of Hymenoptera Research. Native to China, Japan, Taiwan and the Korean peninsula, the brown marmorated stink bug (Halyomorpha halys) has already established in areas of the United States and Europe and continues to spread. It is highly damaging to a wide range of vegetable and fruit crops, including peaches, apples, pears, soybeans, cherries, raspberries and pears. Curiously, those infested areas in both the USA and Europe also saw the arrival of the samurai wasp (Trissolcus japonicus) amid assessments whether releasing samurai wasps in the wild should be warranted. “Classical (importation) biological control of invasive pests, where natural enemies are imported and intentionally introduced from a pest’s area of origin, involves years of research to assess risks and benefits of proposed introductions, followed by regulatory approval,” explain the researchers in their paper. In two consecutive years (2017 and 2018), the team of Dr Abram placed a total of 1,496 egg masses (41,351 eggs) of brown marmorated stink bugs at 16 field sites in coastal and interior British Columbia – already known to host large and well-established breeding populations of the species – in order to monitor and identify the local enemies of the pest. 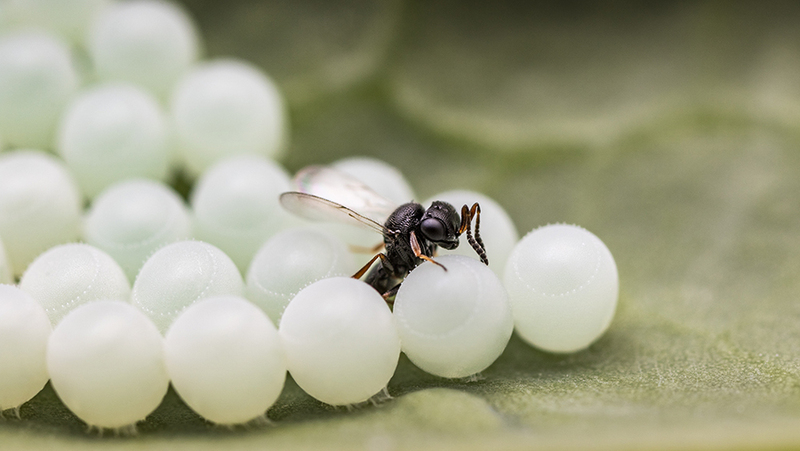 Later on, when the researchers retrieved the eggs and studied their parasitoids, they found three native wasp species, but their parasitism appeared largely unsuccessful. Female samurai wasp (Trissolcus japonicus) collected from Chilliwack, British Columbia. Photo by Elijah Talamas. According to the scientists, as well as previous studies conducted in both the USA and Europe, native wasps would often lay their eggs in those of the brown marmorated stink bug, but their larvae would rarely complete development. Even when they emerged, they were unlikely to produce their own offspring. In one of the egg masses, however, the scientists noted that all eggs had been parasitized and, moreover, each produced a viable wasp. Later, the offspring would register a success of >90% in parasitizing brown marmorated stink bug eggs. Following these observations, the team identified these parasitoids as samurai wasps. While the species is currently being redistributed within some US states on purpose, samurai wasp populations advancing to other localities suggest that much like its host, the parasitoid is also becoming a “global invader”. Therefore, it is quite possible that the samurai wasps in British Columbia have simply crossed a distance of >400 km from nearby Washington State, and the wasp is still at the early stages of its establishment in Canada. “Nonetheless, the detection of this exotic biological control agent in Canada concurrently with regulatory review of its intentional importation and release is emblematic of the current uncertainty around regulatory control on the movement of biological control agents across borders,” comment the authors of the study. Field surveys and extensive analyses are currently underway to track the establishment and biological control impact of the samurai wasp in Canada and also reveal how the species ended up in British Columbia.